Ships in fall 2019 (Allium ampeloprasum) Individual cloves grow to produce large bulbs weighing ½ lb or more (as large as a grapefruit). 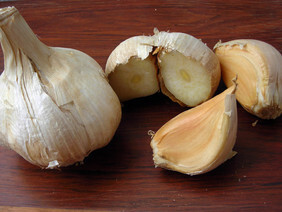 This garlic is more closely related to leeks, and the flavor is mild and sweet. Serve alone as a steamed vegetable with butter and bread crumbs, or bake it in the oven. Yield by weight is 8:1 under good conditions. Comes with our Garlic and Onion Growing Guide. Starter Package: 16 oz.